Today is the first time that I carry a heavy load with the lightest of hearts. 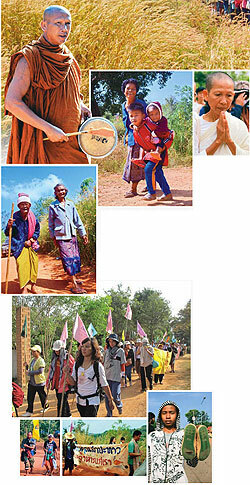 It is the last day of the annual dharmayatra, a semi-spiritual, semi-ecological walk held by a group of monks and laypeople in Chaiyaphum to raise awareness of environmental degradation in the Lampathao watershed area. Every day we march on, often under the scorching sun, for a few kilometres, from one village to the next. Twice daily we stop at a temple, either for lunch or for the night's rest. The food is rudimentary, as is the accommodation. The scenery on both sides of the country roads we take seems mostly a vista of perennial monotony - nothing much grows here besides cassava, eucalyptus, sugar cane and weed grass. Only every now and then do we come across trees of any substantial size, or flowers of unusual shapes and varieties. And yet little by little I start to feel a sense of indescribable bliss expanding inside me. There is an inner contentment, peace and freedom, as if I have tapped a spring of life within myself while trudging up and down the hills and plateaus along with hundreds of other dharmayatra walkers, my companions on this one-of-a-kind spiritual journey. Aware of the long hours of heat and dust, on any given day I deliberately try to bring as little as possible with me while walking. The rucksack can be put on the common luggage pickup trucks provided by those who set up the programme. I carry nothing but a bottle of drinking water in a ready-made strap, a camera, a pakhaoma loincloth to protect my head and a small carry-on bag to keep cash and coins. Still, even with such minimal belongings, I usually end up being one of the last of the entire group to arrive at each destination. But this morning, after the first few steps, I notice two sisters, both in an advanced age, struggling with the bags of food and clothes they brought along with them. The old ladies just joined the pilgrimage the night before, in a rather impromptu fashion as they were visiting the same temple as our group. Thus they knew little about preparation protocol. A middle-aged woman offers to help with one of the sister's belongings, and I with the other's. After all, this is an opportunity to make some concrete merit right on the spot. And while carrying the sister's two heavy plastic bags, I discover to my great delight that I can feel the load in my hand but without it being a burden on my mind. "The body may suffer, but the mind doesn't have to; just be aware of the heat, the frustrations and the pain without the mental attachment to any of those sensations," advised Phra Paisan Visalo to fellow walkers on the morning of my arrival. "Oh! And don't forget to smile as you walk too," added the monk as we started lining up in front of the temple. Now in its 10th year, the Lampathao dharmayatra has attracted a steadily growing number of participants. From a small gathering of a dozen or more locals, the movement has evolved into a unique phenomenon where hundreds of people from different corners of the country take part every year in the arduous trek as "representatives of nature". According to Phra Paisan, a mind that is sensitive enough will be able to hear the wails of Mother Earth, which has long been suffering from abuse at human hands. Years ago, the Lampathao watershed area was among the most fertile in the Isan region. Phra Paisan said his mentor, Luang Por Khamkian Suwanno, used to talk about the wild elephants, tigers, deer and other beasts that once roamed Phu Lankha forest, where the Lampathao River originated. However, in the mid 1960s, the Thai government began issuing logging concessions. Following the loggers were villagers seeking new land on which to earn a living. They cut down the remaining trees and turned the plots into fields of cassava, jute and other cash crops promoted by the authorities. Listening to Phra Paisan describe how in those massive logging days the sounds of the falling trees could reverberate for hours, I try to imagine how wonderfully lush the Phu Lankha forest must have been. And how sad to see the dry, barren hills with little sign of life surrounding us now. The dharmayatra walk seeks in part to bring practical aspects of Buddhism to life. The forest is of vital importance to every being, not least the so-called dharma practitioners. We can discover dharma, says Phra Paisan, because of the very fact that nature has been there for us to observe her marvellous successive changes as well as provide us with generous sustenance. So we choose "walking" as a way to send her crucial plea to the public - that we are willing to go to great lengths at our own expense to share our concerns for the well-being of our Earth mother. But we are not only walking for the nature without but also the nature within. As I trudge forward, step by step, I learn to appreciate the value of having little. The less we carry, the freer we become. Just by opening our eyes we can see pretty flowers dancing in the periphery. When our ears are attuned to the quiet tempo of our heart (and the small drum played by a monk to mark our footsteps), we can also hear the soft, gentle rustle of the wind frolicking among the leaves. And we become happy quite easily. A glass of cool water offered by the villagers quenches thirst right away. The occasional breeze that comes amid the relentless midday sun is something to be grateful for. Eventually the chaotic rhythms of the city, where every day our life is dictated by desires, worries and anticipations, melt away as we march on. Contrary to some preconceptions, dharmayatra is not an exercise in self-torture. The longer I walk, the more impressed and moved I become with this simple way of educating the mind that Lord Buddha has imparted onto us. I can be stronger and more persistent than I ever thought I could be. Having a try at walking barefoot, I start to enjoy the cool, soothing feeling of connecting with the earth directly as well as to meditate on each step carefully lest I step on the sharp-edged stones or pebbles. I have also learned not to fret about "minor" things (somehow we survived without much ado the nights at those temples with only two toilets to serve the hundreds of us). Slow as I am, at least I manage to make it at the end of each day. There is no deadline, no competition, no particular goal to strive for. The most important step is the step I am taking at this very moment. And the most important people are those who are in front of, next to and right behind me. Without engaging in small talk, I become aware that my fellow walkers can all be my teachers - for various lessons. There is a mother and son pair who quietly go about picking up rubbish along the way. The little boy asks his mum why they have to clean up after others. I can't catch the mother's reply, but the scene reminds me of Phra Paisan's talk one morning when he cited an African proverb to the Isan villagers about how we must do our best to keep the environment in good shape for future generations. After all, he said, "nature is not a heritage passed down from our ancestors but something we have borrowed from our descendants." Then there is the lesson of perseverance. A young, long-haired lad has been tagging along behind the group day after day trying to pick up as much of the rubbish strewn along the way as he can. The rubbish bag in his hand grows heavier and heavier the longer he walks. But he shows no sign of giving up this seemingly futile mission. I ask him why he is doing this, and his succinct answer pierces my heart: "Because I can't pass it by without doing something." On this journey of life, each of us can become a guiding light for another, knowingly or not. At times I feel so exhausted that I toy with the idea of giving up (and hopping on the stand-by pickup available to those who need to rest). Then I think of that young, blind woman who walks on and on, sometimes barefoot, a few metres in front of me. Nong Gig - that is her nickname - came with a friend whose arm she may be holding, but her defiant spirit probably has no need for such a clutch. When I meet her again by chance, I ask for her secret. Her face all tanned, she says she can stick it out because she learned about a 74-year-old man who came with his daughter. "If the old man can make it, why can't I?," she says matter-of-factly. Even the Isan folks have taught me some simple pearls of wisdom. In one village, I ask for directions from a middle-aged woman who is passing by (having dropped behind the rest of the group as usual). The kind villager tells me how glad she feels to have a chance to offer us some lunch at the community temple. Such simple generosity towards strangers is rare in the big city with all its material abundance verging on excess and extravagance. Luang Por Khamkian Suwanno (top) and Phra Pisan Visalo, the driving force behind the Lampathao dharmayatra. While relating the problems of deforestation and the spread of toxic chemicals in the soil and waterways, Phra Paisan cautions against blaming it all on the local people. The government's policies - in promoting cash crops and not addressing the widening social inequality among the populace - have inadvertently played a large role in the polluting of the world. Our consumerist lifestyle, sucking up resources from rural areas, is no less an accomplice. If we can view everything with an impartial and understanding mind, we will be able to see the larger picture. And perhaps we will understand why the folks here may support a certain politician despite his fundamental flaws and in contrast to the opinions of their more educated, city-based counterparts, says Phra Paisan. During the week-long dharmayatra walk, the procession is marked by flags of different colours fluttering cheerfully in the wind. 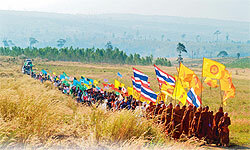 There are the saffron-coloured wheel-of-dharma flags, the tri-coloured national flags, the flags carried by the young and old, men and women, in shades of green, yellow, pink, orange, blue and purple. The colours are only used temporarily to help in the division of volunteer labour among the participants. No more, no less. If we could realise the folly of attaching to a dogma, a person, a belief, wouldn't we live a richer, freer existence that could benefit more people, not least ourselves? The theme of the 10th dharmayatra is, incidentally, "to go against the stream". The trek may be more difficult in the beginning as we struggle against the altitude of the land. But the higher we walk, the cleaner and fresher the air and water and the greater number of trees. And as we reach the higher plateaus and look back on the plains below, we come to recognise the beauty of the countryside much better. Likewise, Phra Paisan says, the higher up we stand, the less discriminatory a view of the world we will have. We will see humans as humans, not as rich versus poor, Thais versus foreigners, yellow-shirts versus the red-shirts. And way above the earth, we will no longer be able to distinguish between national borders. We will see beyond the worldly divisions between humans, and between humans and other beings. The wisdom of seeing oneness in everything will spring forth as we drop our own greed, anger and ignorance. The last stop is in sight. Only a few hundred metres and we will reach the main hall of Wat Pah Mahawan, Phra Paisan's forest temple where a traditional Isan bai-sri ceremony will greet us. But the end is in fact only the beginning, I have come to realise. For the real dharmayatra is a life-long journey, which will continue until our last breath, with the present step being the most important one.